Some major technical issues dampened the Republican National Convention when video panels and other parts of the high tech gear installed in the Quicken Loans Arena failed Wednesday night. The issues began around 10 p.m. Eastern and affected the teleprompter system, video ribbons fronting the audience tiers as well as the multiple large format panels installed throughout the arena, including the ones directly behind and above the stage area and suspended from the ceiling. While Donald Trump’s son, Eric Trump, was speaking, the video bands ringing the space began to flicker. Soon the issue spread to the huge panels mounted from the ceiling, making it difficult for those seated farther away from the stage to see the speakers. Eventually, the large video panels directly on stage were lost. There were also reports of minor issues with the teleprompters, though it appears at least some of them were still available for speakers. The speeches, meanwhile, went out without much interruption. 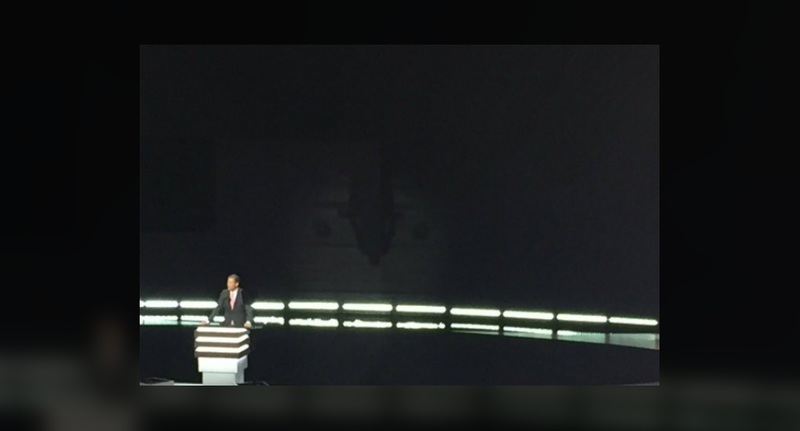 The stage design for the RNC included a wide span of LED perched high above the dais, with smaller, staggered ones forming the background behind the lectern. All of this was framed with blocky, silvery-gray angled elements. The RNC relied heavily on its video projection screens to enhance the messages delivered from the stage. Multiple background colors and designs we used as well as using the video walls to display speaker information and social media streams. The crews at “The Q” — as the arena is known — were able to restore the stage screens by around 10:30 p.m., but the video bands would remain down for the remainder of the evening. No word on what caused the issues. This high profile failure does raise the issue of how TV stations, who are becoming increasingly reliant on video wall installations similar to the ones used at the RNC, could fall victim to the same type of problem. Though much of the video walls at the RNC were only temporary, which could have lead to the failure, technology can always fail even with more permanent and tested systems like those on TV news sets.